Welcome to this episode of the Real Fast Results podcast! Today’s special guest is Daven Michaels, who is really a marketing phenomenon in his own right. He just has a way of grasping marketing opportunities, evaluating them, and ultimately turning them into awesome money-making ventures. He’s definitely going to lay down some incredible wisdom throughout this show. Daven is the owner of 123 Employee, and he has basically made a career out of living the American dream. In fact, his entrepreneurial career began when he was about 15 years old, and he never looked back. He’s actually turned multiple passions into prosperous businesses and careers. For example, he has been a bestselling music and television producer, and he has produced some of the biggest acts that have come through the music business. As well as being a successful entrepreneur, he’s also a bestselling author and a professional speaker. Thanks for having me! I guess the big takeaway for today is going to be lead generation. I believe that this is the biggest challenge that entrepreneurs face. Well, there’s actually two. I have the privilege of speaking on stages all over the globe, and so I ask entrepreneurs, “What’s the biggest challenge you face in your business today?” Although I always receive a myriad of different responses, it always comes down to two. The first is time. Time is the #1 precious commodity that none of us can buy. Once it’s gone, it’s gone. It’s fleeting. The other is leads, or business coming through the door. I believe that if you can solve that challenge in your business. If you can dial in your marketing, and if you have a massive amount of leads and traffic coming through the door, and your bank accounts are overflowing with money, then you can probably buy yourself out of any challenge that you face in your business today. 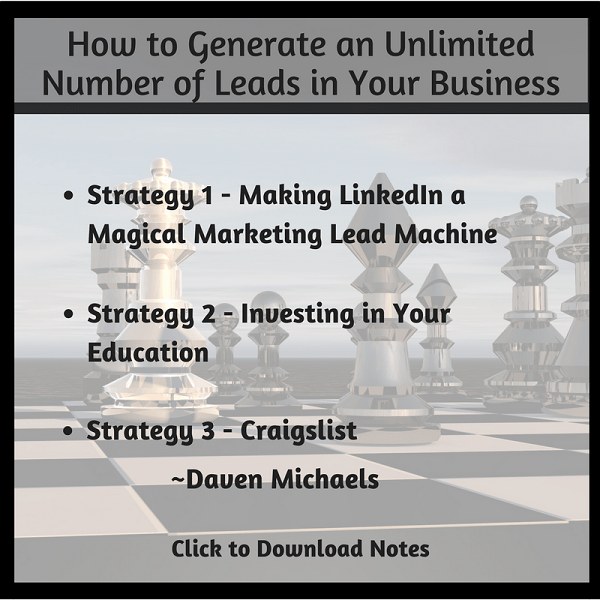 So, today I’m going to show you how to generate an unlimited amount of leads in your business. 123Employee.com, and actually, if you go to this site, you’ll find a whole bunch of goodies on the right-hand side. There’s a bunch of free stuff for you, like our 5-part list building series and our VA service guide. So, jump in there, and we’ll send you a bunch of great content on a weekly basis, including all kinds of different ways to grow your business and strategies to leverage what you’re doing.